Since the arrival of Europeans in Aotearoa Māori have been alienated from their land, with their ownership now, just a fraction of what it was. This alienation has seen a consequent clearing of land, degradation of soil and water quality and increased erosion. Some Māori are now commenting that Pākehā have had a go at land management and the results haven’t been great, so its time for Māori to have more say in the Governance of land. The Treaty of Waitangi, signed in 1840 is the founding document of this nation. There are two versions of the Treaty, one in English and one in Te Reo, and the interpretation of these two versions remains contentious. According to the NZ History website in the second article, “Māori give the Crown an exclusive right to buy lands they wish to sell and, in return, are guaranteed full rights of ownership of their lands, forests, fisheries and other possessions”. Over the last few decades there has been encouraging movement towards the spirit partnership aspired to in the Treaty. For example in March 2017, Parliament passed a law recognising the Whanganui River as a person in the legal sense, aligning the traditions of Western law and Mātaurangi Māori. We have an opportunity to grow that partnership that for more than a century remained embryonic. According to Waitangi Tribunal website, traditional Māori society centred on kainga, that can loosely be translated as villages, or home. The most evident remnant of this is the marae. Northland has well over a hundred marae scattered throughout the region. Alongside a general depopulation of rural areas, many marae have become less active. Another renaissance for our partnership would to see the mana of these marae restored and for them to become once again kaitiaki (guardians) of the land and consequently, bastions of climate resilience. The NRC has developed catchment plans, so far for five Northland catchments. A Māori led Otago University research project “Pā to Plate” focuses on the Waitangi River catchment. The potential with a full catchment focus is to work with marae and others in the catchment to develop both a more resilient food system and climate resilience. One of the researchers, Northlander (from Oromahoe) Hirini Tane, in this post ponders the future of marae. My current doctoral research recognises that marae have been a continuous focus of tribal values for over 800 years in New Zealand (and 3000 plus years in the Pacific), but continue to feel the impacts of land alienation and Post World War II urbanisation. With this background I therefore ask ‘what will our marae-community look like in 100 years?’ in an attempt to find some cross-generational solutions for the next band of Oromahoe-street rats. I would like to think that those land-owners sharing sub-catchments with marae will be mindful of the importance of forging social contracts amongst neighbours to recognise the enduring role of marae as kaitiaki, and in doing so, come under the shelter of the marae and support its mission. The Māori Dictionary defines tikanga as “the customary system of values and practices that have developed over time and are deeply embedded in the social context”. The Amokura Iwi Consortium present tikanga as a model of sustainability with the key elements of manaakitanga, kaitiakitanga and he oranga analogous to the social, environmental and economic dimensions of sustainability. Generally, Māori organisations grounded in tikanga have a more natural and congruous relationship between these three elements of sustainability than Western counterparts who have had rediscover the non-financial drivers of sustainability. Full engagement with Māori is vital to realise climate resilience in Northland. How can we support the restoration of the mana of marae to support food system and climate resilience? 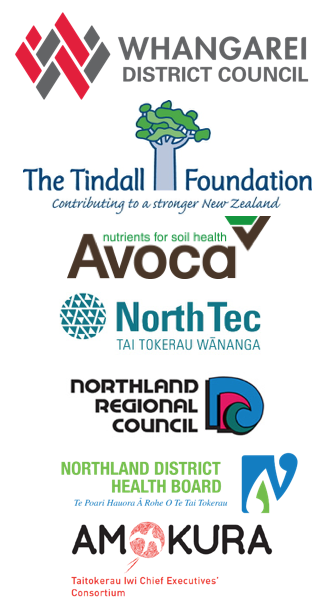 Which Northland marae are best positioned to accelerate processes to support food system and climate resilience?